There is a need for motorcycle repair business in Bangladesh if you’re in an area where motorcycles are popular. And as there are a lot of motorbikes in the country, a motorcycle repair business has increased demand. So, if you have the right skill, you can set-up your motorbike repair business in your garage or workshop at home. What just you need to do is simply clean-out the garage to store bikes, extra parts, and tools. Also, make a word-of-mouth advertising with friends/family, at local rider hang-outs, and bike rallies. If you want to make your customers to encourage repeat business, you have to provide a preventative maintenance program. That’s the program where you’ll keep your customer’s motorcycle in great shape with well-maintained. So, you have to learn if you’re not, how to fix engines and brakes. As it’s the mode of transport, it has the need for repair and maintenance. That’s why it’s the experience and skill in repairing and restoring motorcycles if you have been a long-time motorcycle enthusiast. Or, you may have one business waiting to flourish in your hands if you just have the basic knowledge of motorcycle repairing. Here we’ll discuss how motorcycle repair business in Bangladesh while assuming that you know more than enough about brakes and tune-ups. It should focus on both long term and short term operations when you make a motorcycle repair business plan. Also, research what your plan is to use a professional service and remember that the more detailed, thorough. Moreover, you have to make a plan for building to long-term revenue management, and marketing strategies along with up front and overhead costs. These are why a clear plan is essential for success as an entrepreneur. If you determined to open a motorcycle repair shop would have to make is about acquiring or renting a place or an existing shop, it’s one of the first and major decisions. So, if you are renting, you would need investment to pay a deposit to the lessee. That also will cover your deposit for gas and electric company and buy tools and equipment like compressors, tire changers, motorcycle lifts. Moreover, what comes with the location criteria is including population, competition, street types, motorcycle counts, and more. That’s why when you pay a close attention to the relative traffic, types of local businesses, and anything that looks for sale; you can start by driving around your target area. Some of the motorcycle repair business in Bangladesh is self-learned where others have formal training from various institutions. While running the overall operation of the business yourself you can start one by hiring an experienced technician. This is for those who have a good business sense but don’t have any background. Also, it doesn’t mean only repairing motorcycle but running a shop to sell motorcycle accessories as well. Moreover, it also means that you’re improving a motorcycle’s performance by modification. 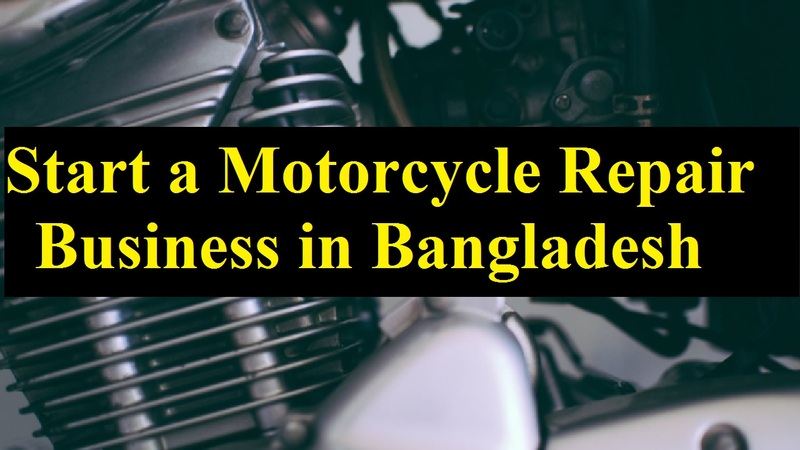 Those who are the owner of motorcycle repair business in Bangladesh; they have an established and respected reputation within the community. This is because they are not only well-known for their skills in repairing and/or customizing bikes but active in local motorcycle organizations. Much of your marketing will be through word of mouth and stay active because this is such a tightly knit community. You’ll get critical in reaching potential customers when involving and informative social media presence. Also, assist you in reaching a broader audience when you’re representing on the online ads and motorcycle magazines. It’s important for all businesses that you have to try more to know about your competitions in your area. That’s why it’s much important to know about the customers they have and how aggressively they are marketing. You have to know what they will do if you open your motorcycle repair business in Bangladesh. What’s more, get the reviews of the clients whether they are frequent users and very loyal. Picking a location with some elbow room between you and competitors is important as the entrenched local competition can be dangerous. As a result, it’s very much important to analyze the competitions and their potential solutions. Your motorcycle repair business usually not need another business license in addition to the trade or business license. You can register your company either as a limited liability company or sole proprietorship business. Also, you need to get a trade license and tax identification number along with other local requirements. If you follow zoning requirements, you’ll get all necessary paper works that you need. Also, there may be subject to value-added tax for some of your inventory. As the paper works are essential, you can’t start your business without them. But, there is another option that’s you can talk to your lawyer if you’re not familiar with these terms. It’s that perceived by the public and what your company stands for, as well as how your business calls branding of your company. When you have a strong brand, it’ll help your business stand out from competitors. Over the pass of time, the branding may become a franchise with a great famous. That’s why the business brand is valuable for a long-term business. Before you can open for business, you’ll need to register for a variety of state and federal taxes. To keep your finances organized and makes your business appear more professional to your customers, you need a dedicated checking account for your motorcycle shop business. It’s critical to understanding the financial performance of your business while recording your various expenses and sources of income. If you keep an accountant, you can keep accurate and detailed accounts also greatly simplifies your annual tax filing. For all business owners, insurance is highly recommended. And workers compensation insurance may be a legal requirement in your state if you hire employees.